"Chiseled rock, wrought iron, and antique wood form the Country Chapel’s courtyard entry. Stained glass windows, rustic gables, Teak wood doors, and 18 foot steeple beautifully appoint the chapel’s exterior. 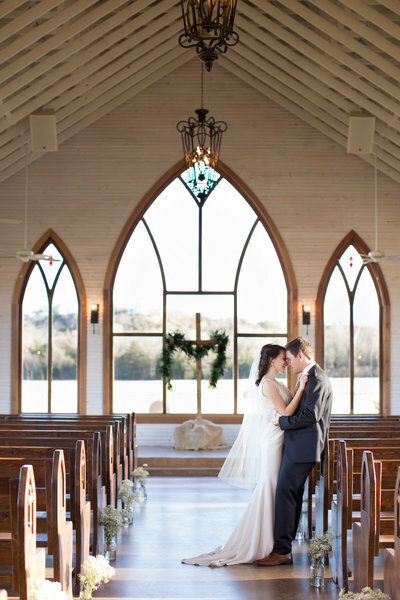 Inside, a breathtakingly beautiful setting of timber trusses, rustic chandeliers, and antique church pews set the tone for the reverence and significance of this day. And the piece de resistance; Arched picture and stained glass windows framing the tree covered hillside creating a most picturesque ceremony backdrop."